I love this little spot along the Guadalupe River! 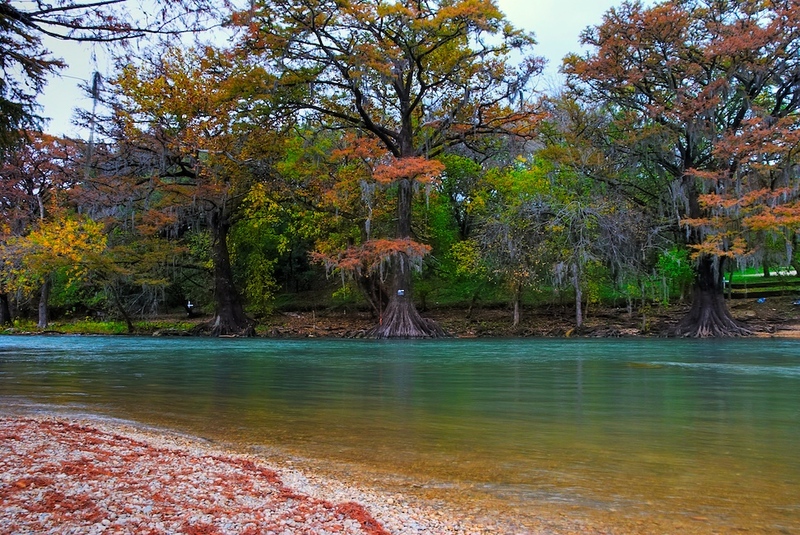 The Guadalupe River winds its way through parts of Central Texas, and at some point on its journey it passes through Gruene, TX which is a tiny little town between Austin and San Antonio. It's best known as the home of Gruene Hall, a sort of country bar where folks go to see the live music. It's all pretty cool. Anyways, just behind Gruene Hall and down the hill is the Guadalupe River, so whenever I have the time and the camera handy, I try and grab a few shots there. I have stood in this spot several times over the years, and always enjoy shooting this area. I just find it to be beautiful. I caught this one a couple of months back. I was hoping for some better Fall color, since there were patches of it in and around Austin, but not much here. That happens in Central Texas - Fall color is not something we get a lot of. Oh well, you still take the shot right? This is a really old photo, though I just got around to processing it last week. I took it back in 2009, actually. It’s been almost 4 years. See what I mean when I say I will never catch up? It’s ok, though. To be clear, I do NOT delete shots I don’t like when I return from an outing, after dumping them all into the library and reviewing them. Unless there is something seriously wrong with the shot (or set of brackets in most cases, since I shoot mostly HDR) I will hang onto it. Why not? Storage is cheap, and doesn’t take up any space in the physical sense. Anyways, I am off topic here. Bottom line, this is a shot I took about 4 years ago, but just processed and am just now sharing. While it falls into at least the first 2 categories above, I still like it. This is the Guadalupe River in Gruene, TX from a couple of years ago. I was in my library and came across some brackets from here that I never did process, so I gave them a go. It was a lovely Fall day, as you can tell, and the trees were showing off their wonderful Fall colors, which isn’t too common in these parts. Sometimes you just happen to be in the right place when you need to be! Gruene is a nice little town south of Austin, and the Guadalupe River runs through it. I happened to pass through, had my camera, and was happy to find a nice bit of fall color. This was taken last year - haven't had a chance to visit this year unfortunately. If you are ever in the area, be sure and make a stop! This is the Guadalupe River as it runs through Gruene, TX. Gruene is a very small town that sits between San Antonio and Austin, and is a bit of a historic place itself. There is not much to do there, which is one of the nice things about it, but there is this beautiful stretch of river to admire. I enjoy hiking around rivers and lakes, though I don't have a lot of time for it, and doubly enjoy it when my camera is in tow. This was taken last Fall when the colors of nature were on full display. I'll have to go back soon and see what it looks like in the summer, though I doubt it will look like this. Which reminds me, in the summer the river is usually choked with people floating by on inner tubes, so scratch that idea. Anyways, it is a beautiful place and a wonderful river to photograph. This is a 6 exposure HDR at f/11, with exposures from +2 to -3, merged in Photomatix and adjusted in PSE and Aperture. Gruene, TX is a sleepy little town (and I mean little) that sits south of Austin, but it is a nice place and possesses a lot of historic charm. One of the main attractions there is The Grist Mill, which is a restaurant housed in the old mill, situated above the Guadalupe River. This shot is near the main entrance. 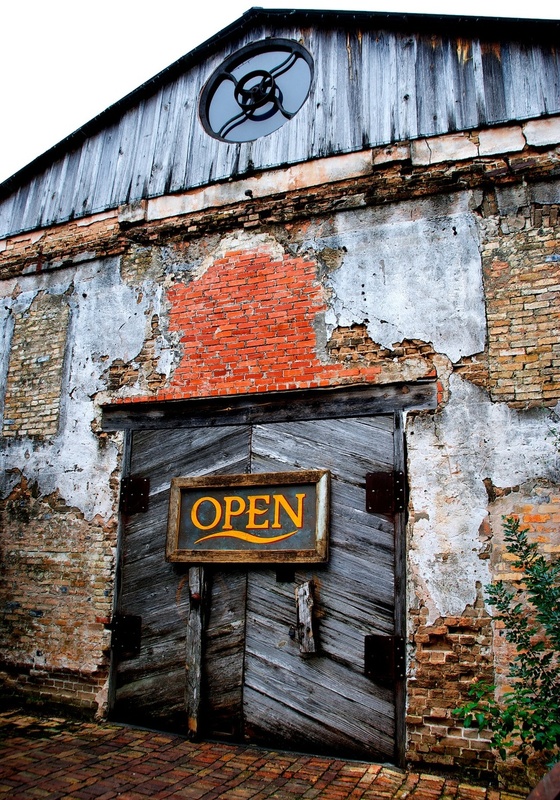 I just liked the tattered old look of the door and wall, with the bright "Open" sign on it. It seemed like quite a contrast to me, as if they were trying to cover up the age of the place. Anyways, just something that caught my eye. This is a single exposure, taken at f/5.6 and 0ev. I made some adjustments in PSE around Contrast and a little pop in Topaz Adjust. If you get a chance, get down there sometime and enjoy the views over the river! 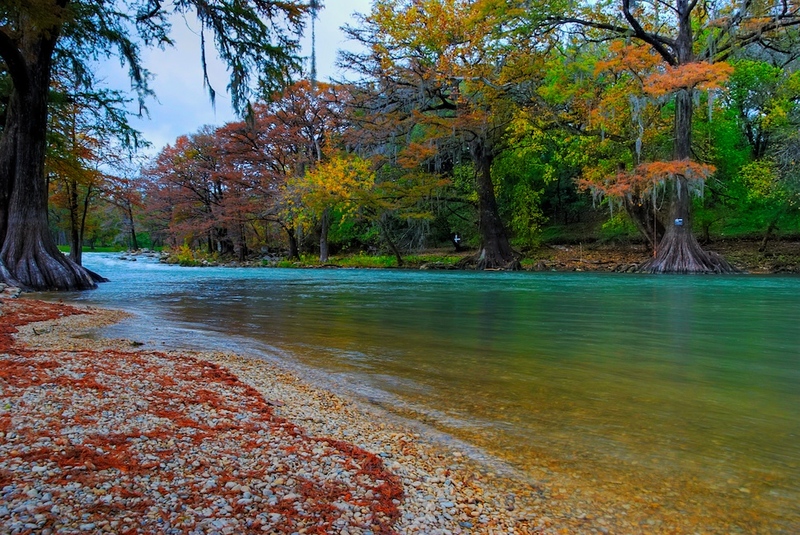 This is a photo of the Guadalupe River, and was taken outside of Gruene, TX (pronounced "green"), which is a nice little town between Austin and San Antonio. I took this back in November, which for us often means we are still wearing shorts since our Fall season is usually pretty mild. Fortunately we did get some color this year, which is great. Fall is my favorite season, though as I just mentioned we don't get the typical Fall experience here. I would love to get to New England and get some shots of Fall up there, with all the wonderful color and leaves falling! That would be great. This is a 6 exposure HDR taken at f/11, with exposures ranging from +2 to -3. The HDR was created in Photomatix, and then I made some minor adjustments in PSE (Curves, Contrast, Unsharp Mask). 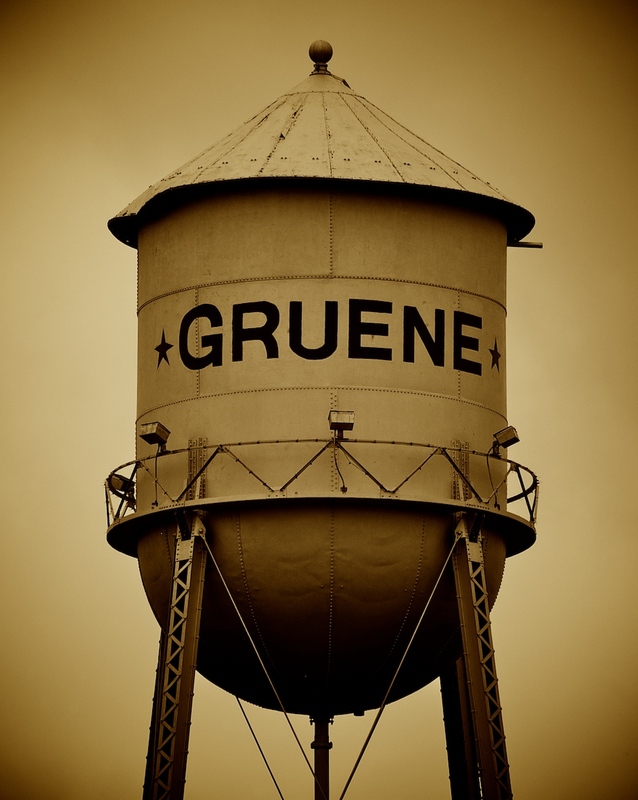 This old water tower rises above the tiny town of Gruene, TX and is an enduring symbol of the community. The day I took this shot was gray and overcast, but no dramatic clouds or anything - basically it was colorless. I went ahead and took the shot, though a silvery-gray water tower did not exactly pop off the screen against a silvery-gray sky. Anyways, once I messed with it a little and added some sepia tones, I thought it stood out rather nicely, plus it gives it that old-fashioned look and feel which is spot-on for this place. Like many folks, I saw the movie "A River Runs Through It", and though I am not a skilled fisherman, I do enjoy wetting a line sometimes. I am drawn to water, not just for the photographic qualities it possesses but also as a student of nature and a member of the human race. It is mesmerizing and captivating. It refreshes my soul, especially running water. There is something about the solitude and the calm consistent flowing of the water that speaks to all of us. 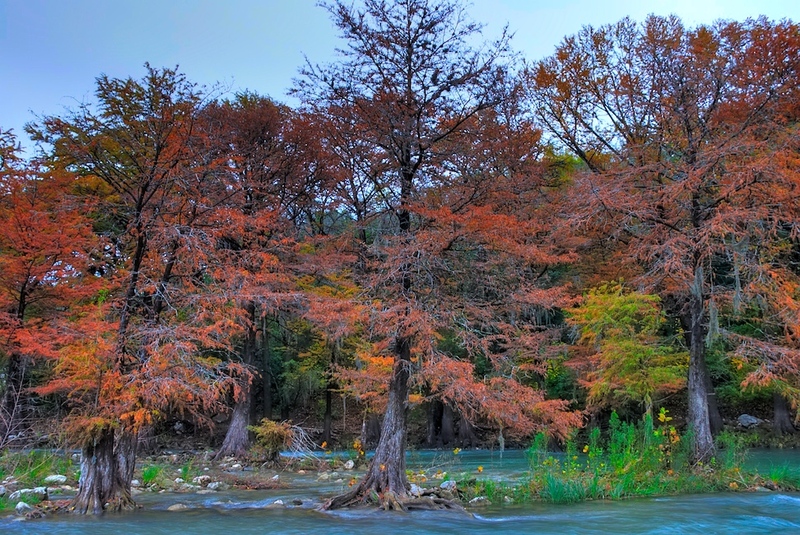 This is the Guadalupe River, in Central Texas, with all the glory of fall represented in its colors. It is shaded by many pecan and cypress trees, which also provide a home for a lot of Spanish Moss, hanging on and swinging in the wind. Believe it or not, this river is also a pretty good trout stream, though it is not a natural occurrence but rather the result of annual stockings. It is spring fed which keeps the water nice and cool, good for both the tourists and the fish, though I am not sure how many survive over the course of our long hot summer (the fish, that is).